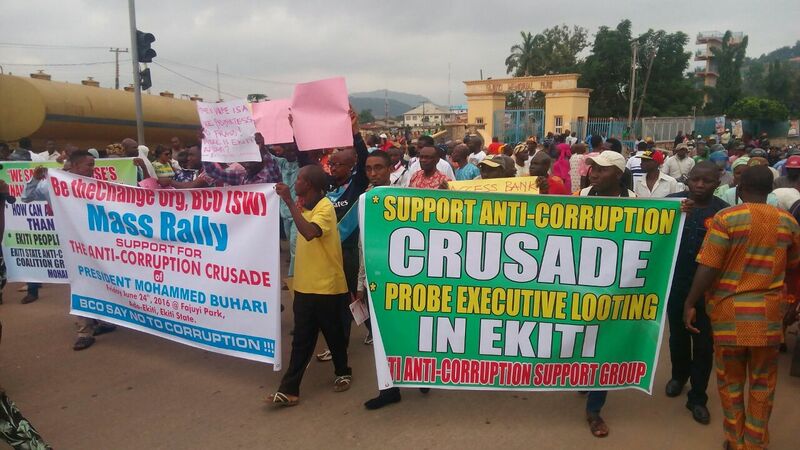 Protesters have currently taken over the streets of Ado-Ekiti, capital of Ekiti state, demanding the resignation of Ayodele Fayose, governor of the state. The protesters, who are chanting anti-government songs, are asking the governor to step down immediately. The demonstrators comprise members of the All Progressives Congress, Conference of Nigerian Political Parties (CNPP) and other groups. Addressing the aggrieved citizens, Kemi Olaleye, chairperson of the group, alleged that the governor has been using his immunity to engage in illicit act. She challenged Fayose to waive his immuntiy, asking anti-graft agencies to go after the governor. This is the second time in two weeks that residents of Ado-Ekiti will witness such development. On June 24, protesters led by Omotunde Fajuyi, an activist, accused the governor of enriching himself at their expense. Back then, Lere Olayinka, spokesman of the governor, had described the protesters as “remnants of the All Progressives Congress in the state”. In a move to counter the anti-Fayose protesters, students took to the streets in solidarity with the governor last week. They accused the federal government of victimising Fayose and key figures of the Peoples Democratic Party (PDP). Fayose has been in the news lately over the freezing of his account by the Economic and Financial Crimes Commission (EFCC).